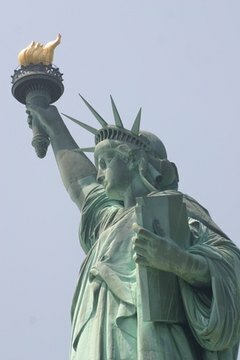 All temporary visitors to the United States are classified as nonimmigrants, meaning that they do not intend or are not authorized to permanently immigrate to the United States. Foreign nationals with this designation are assigned visa numbers, which are prominently displayed in red ink on their nonimmigrant visa stamps. The visa number is the only item on the visa stamp in red ink. Open your passport. Flip to your current U.S. visa stamp page. The stamp will cover an entire passport page and usually sits on the page adjacent to the first U.S. entry stamp received after obtaining your visa. Turn your passport so that the visa stamp reads top to bottom and left to right. The visa stamp is written in English and includes biographical information. Look at the right side of your visa stamp. At the top of the visa is the control number, which is a long combination of letters and digits. Under that is the visa type, your nationality and visa issuance information. Below all of that information is a number printed in red ink. That is your visa number. Soden, J.M.. "How to Identify a Visa Number." , https://legalbeagle.com/6400564-identify-visa-number.html. Accessed 24 April 2019.